Just added an article first published in Trout and Salmon about the Cod Beck by one of our long standing, now life member, Steve Schroeter. It can be found under the articles tag on the menu or click here. We have arranged exchange days with The Cod Beck Fishing Club. They have several miles of the Cod Beck above Thirsk, all small stream fishing. John Aston has kindly agreed to organise this, with members needing to pick up the relevant permit from him for the day they wish to fish. If you fancy a change from our usual waters please use the contact form from this link, or it can be located under the information tag in the main menu. Could members please note that we can only fish for grayling from the stretch upstream of the Caravan site to the top limits of our waters, opposite Thirsk Swimming pool. We are unable to fish the lower stretches below the Caravan site due to autumn and winter shoots. We are planning a Cod Beck invertebrate sampling morning on Saturday 19th of October. If you are interested in seeing what our trout and grayling eat then please come along. It should be very interesting. Please feel free to bring anyone along who might enjoy this. Alastair Logan is kindly running this and we are intending to meet at Worlds End at 10AM. Please note even if you aren’t a member of Sowerby Angling Society but are interested, then please do come along, but could you possibly let us know via our “contact us” page so we have some idea of the numbers to expect. 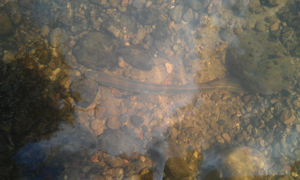 We are getting reports of numbers of freshwater Lampreys returning to spawn in the beck, which is good news (Mid April 2013). Try to disturb them as little as possible. In particular try not to damage their spawning redds, or nests as they are sometimes called. 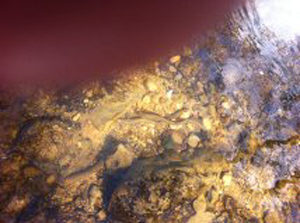 These are easily seen as small depressions with clean gravel and stand out from the surrounding river bed, avoid wading on them. Regarding the fishing, the beck is fishing extremely well at the moment. 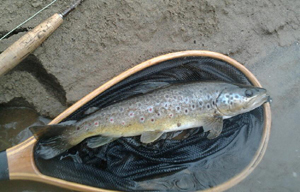 I’m getting reports of a lot of trout being caught, mainly 7-10 inches with a sprinkling of better fish up to 1lb 10oz. If you have caught a better one please let us know.